Nineteen people have been confirmed dead in an accident that occurred today afternoon at Towei hill in Sipi town council, Kapchorwa district. 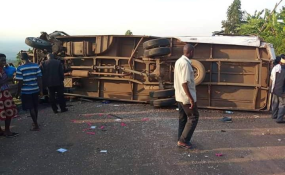 The accident occurred when a government-owned bus, registration number UG 2833E belonging to Kiryandongo Technical Institute, lost control and veered off the road at about 4.30pm along the Kapchorwa-Sironko road. It overturned several times killing 19 people on spot. The occupants included staff of National League of USA, an NGO based in Kiryandongo and Masindi who were returning from a three-day tour of Sippi falls according to Sipi regional police spokesperson, Rogers Taitika. Six survivors have been rushed to Mbale and Kapchorwa hospitals for treatment while bodies that are yet to be identified have been taken to the mortuary. The cause of accident is yet to be established.